If you rake your brain a bit, you may remember an article we posted last week describing our trip to DO Montsant with Tim from Winecast and Miquel, the export director for Bodegas Laurona. 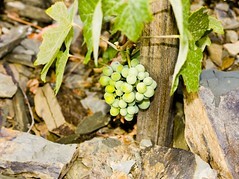 Our story, unbeknownst to you, ended right before lunch when we changed our focus to Bodegas Clos Fiqueras in DO Priorat. The sounding bell to announce the switch was given by the owner of the quaint little restaurant when he sat us down at our table like four perfect little accouterments to his brightly colored café. Our table was located on small loft on the second floor containing four tables, a narrow wooden antique banquet and long railing providing the perfect view of each dish served below. The walls were bright baby blue with yellow accent to compliment the exposed wooden beams. Along the walls hung small pictures of herbs, flowers and things you might find in a family owned Midwest café. Actually, I think the greatest charm of the restaurant was that its style didn’t fit with any other Spanish restaurant we had come across in our travels so far. The enormous bay window, exaggerating the heat fumes coming up from the street, reminded you of where you were, but the minute you turned away, you were teleported away from Spain into another land entirely. The owners, a husband and wife team maybe in their late fifties, are both unbelievably talented not only in there ability to cook, but in their wine service as well. Granted, the region is teaming with wine aficionados, making it a requirement for any successful establishment to have a series of wine paraphernalia within easy reach, but theirs were unique. A series of brightly colored spitting buckets lined the stairway wall, while a variety of crystal decanters and Riedel stemware hit somewhere on the first floor, hidden from my line of site. As both the 2004 Clos Figueres Priorat and 2005 Clos Figueres Priorat Font de la Figuera were placed on the table, so too were a series of appetizers consisting of Iberico Jam sliced paper thin beading with oil, a light fresh mixed green salad, seared butifarra and a light pate spread judiciously on what can only be described as a large square crispy cracker like crust. As for the wines, they were rich, complex and the perfect pairing for our meal. As I had a seared meaty white fish, I actually found the Clos Figueres Priorat Font to be a better match, not overpowering the fish, but not suppressing it either. Ryan had a rich perfectly seared steak (What? Why are you smiling? Are you actually inferring that I would steal a bite or two, off his plate when he wasn’t looking, engrossed in his wine? The nerve of some people!). And from what I remember him telling me, both wines went quite well with his meal, and if anything, were enhanced by the rich smoky flavors of the steak. 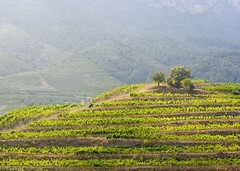 What makes these wines so unique and complex is, in part, a result of the famous ‘llicorella’ (schist) soil in the Gratallops zone of the Priorat appellation. A grayish flaky, dry soil is the agent that forces the grapes to struggle and fight to become the concentrated grape bombs they are – powerful and dense. It was this soil that influenced a close friend and renowned winemaker of Christopher Cannan, RenéÂ Barbier, to suggest that he purchase Clos Figueras in 1997. The name of the Bodega refers to the native Catalan fig tree called, Figueras / Figueres in Spanish and Catalan respectively. Well before Christopher Cannan bought the estate, the land was referred by locals as Figueres, but national regulations dating to the time of Franco’s dictatorship required Spanish spellings on all official documents (well, in reality, he required Spanish on everything, anything and anyone). Consequently, the company name changed from Clos Figueres to Clos Figueras S.A. The Bodega is located just north of Gratallops upon terraced slopes; the land is steep completely saturated in grape vines and dotted with hundreds of olive, hazelnut and almond trees. The vineyards cover approximately 10 hectares of about 2,500 old Carignan and Grenache vines planted a few decades ago under the Clos Figueras label. In 1998, for their Font de la Figuera label, they acquired 7 more hectares and planted Grenache, Syrah, Cabernet Sauvignon and Mourvédre. And although the bodega is owned by Christopher Cannan, René Barbier’s team cares for the vineyards, vinification and aging of the wines. Christopher does, however, does choose the final blends alongside both René Barbier and Fernando Zamora, his oenologist. At the end of lunch, and after 30 minutes of the owner telling lengthy jokes in Spanish with the thickest Catalan accent you can imagine sounding as if he has an enormous Matza ball stuck inside his jaw, we ventured into the sweltering heat to the cool and comfortable air-conditioned car to fulfill the second half of our tour. The Clos Figueras vineyards overlook the quiet and serene Ebro river valley. Other than the whoosh of the wind, and the caw of the occasional Magpie, your view is only that of vineyards and mountains. In the far North, you can see the Montsant mountain range, rising to over 1000m topped with the famous Scala Dei Hermitage; the South of the vineyard lies the Mola de Colldejou and the mountain ranges of Llebaria and Santa Marina. Apart from the Clos Figuera’s well tended vineyards, approximately 135 Arbequina olive trees contribute to the local production of the DOC Suiirana olive oil. For anyone who plans on visiting this region, buy a bottle, or five. Native to Catalunya, the Arbequina is known by its small green/violet round shape, producing elegant olive oil that tastes delicious with simply a piece of fresh bread to soak up all the complex and sensual flavors. Maybe I should switch to being a olive oil virtuoso? We bumped and jostled inMiquel’s little four-door throughout the afternoon as the sun beat harder on upon the steep terraced vineyards. When we did get out of the car to stand uncomfortably upon the schist (note to self: always double check your spelling of this word!) and view the Clos Figueras vineyards, we were continually shocked that we hadn’t fallen to our unfortunate death. Why? Because schist is a funny jagged rock that looks as reliable as a hill of sand. The minute you step on it, you’re frightened that it’s going to slip, sending you and your broken back to the hospital. Yet strangely, it is quite stable. It doesn’t move as much as you imagine it will no matter how many times you jump upon it, which I did. I can’t promise this my observation is accurate after a good downpour, but when dry, you’re actually quite grounded. My stomach, however, was not as grounded, especially after hours of both eating and laughing. Therefore, I was quite pleased with our stop to Scala Dei Hermitage and a local wine/olive oil shop where I was able to take respite from my backseat position in the car to watch Tim drink from his first purron – one of my favorite parts of the day. After some small talk with our local shopkeeper while nibbling samples of fresh hazelnuts, almonds, olive paste, olive oil, and of course, wine, we headed back to Falset with even more satiated than before. Why do humans go into food comas so easily? Finally, our day ended with warm hugs and embraces with our trusty guide, Miquel, followed by a quick jaunt to a few well stocked wineshops where Tim and Ryan proudly walked away with a case in a half of wine. We’ll be heading back in August for another bodega tour, so stay tuned! Meaty nose with dust, violets, raspberry, roses, black fruit and more and more and more. Tannins are strong but fine and the acidity is medium in strength. Once this wine meets the mouth it really comes alive. Lush anise flavors mingle with black olive, allspice, raspberry, black raspberry and more Intense pure fruit, that makes me come back for more. While the nose makes it hard to remove my nose from the glass. Wines may get better than this technically but they rarely get more enjoyable. Inky color the nose on this is incredible with smokey mint notes followed by black olive, violets, minerals, and dark fruits which create a virtual tapestry for everything else to sit upon. Big tannins come forward in the mouth with flavors of cherry, raspberries, blackberry, anise and cloves. One interesting aspect that showed up at the finish was a hint of oloroso like fruitiness. Great wine. Intriguing floral nose with geraniums (first time for that descriptor), eucalyptus, raspberry, rose and a little of my grandmother’s attic. Medium acidity with pronounced but fine tannins and good structure. The wine reminds me of an orchestra with the nose being the flute slowly drawing you in, enticing you when WHOOSH, your hit with an army of deep resounding drums on the palate. Think of a dozen or so layers of rich dark fruit and spice with the occasional hit of mint and pink roses. Think dark! Midnight in color with black olive, fennel, plum, black cherry and charcoal bouquet. Others commented on the variety of spices they could pick out such as black pepper and caraway, but I wasn’t able to find them as easily. 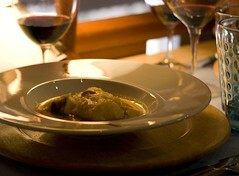 After 30 minutes are so, the flavors perked up showing forest berries, clove and pepper. It was a fun wine, a bit tight and lacking the body I had anticipated, but really a great wine.